In the master bath we replaced everything and gutted to the studs but saved the original barn planked walls. The palette is a study in whites, taupe and washed wood. In the shower, we opened up the views of meadows, forest, and hills beyond, while leaving the corner of the shower structure open to the rest of the bathroom with glass. The sculptural shape of the freestanding tub contrasts beautifully with the glazed plank walls. A towel warmer by Runtal on each end of the tub keeps amenities toasty. The entry door has frosted privacy glass. To accommodate the clients’ storage needs we designed a custom made floating wall cabinet and sink vanity, which was beautifully crafted. The living space is a grand two and a half story great room with two seating areas, a dining table for twelve, and a concert grand piano. Vintage three-inch-thick double doors lead into the space from an interior courtyard. 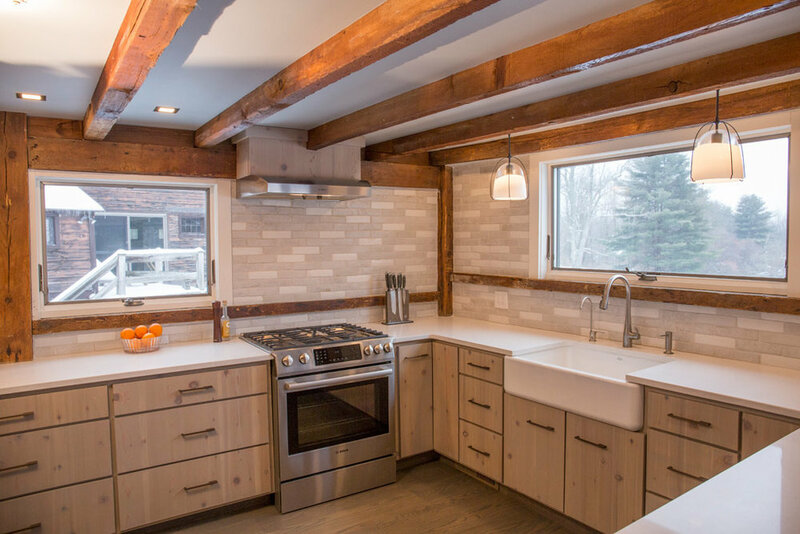 Our renovation entailed resurfacing all the plaster walls and recovering a dilapidated ceiling with crisp new shiplap boards leaving all of the original timbers prominent in a field of fresh white. Pillows are custom Karen Beckwith Creative. 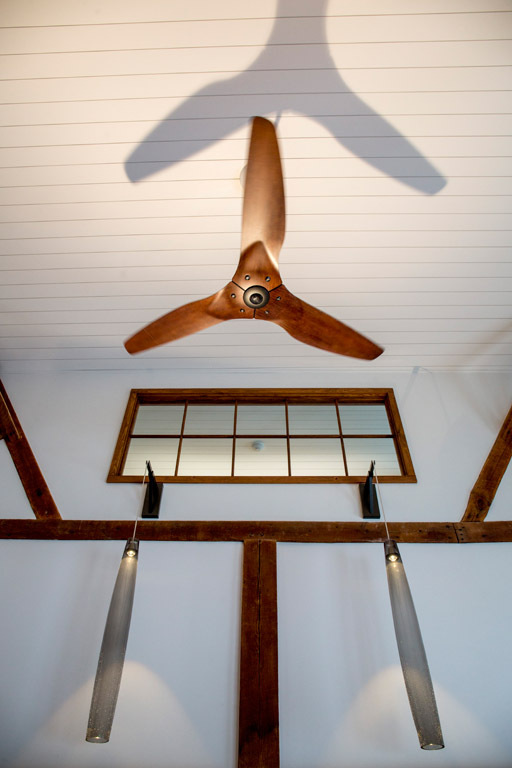 We inserted a custom made interior window to bring light to the upstairs loft while adding sound privacy to the bedroom. Access for wiring new lighting (badly needed) was extremely limited. 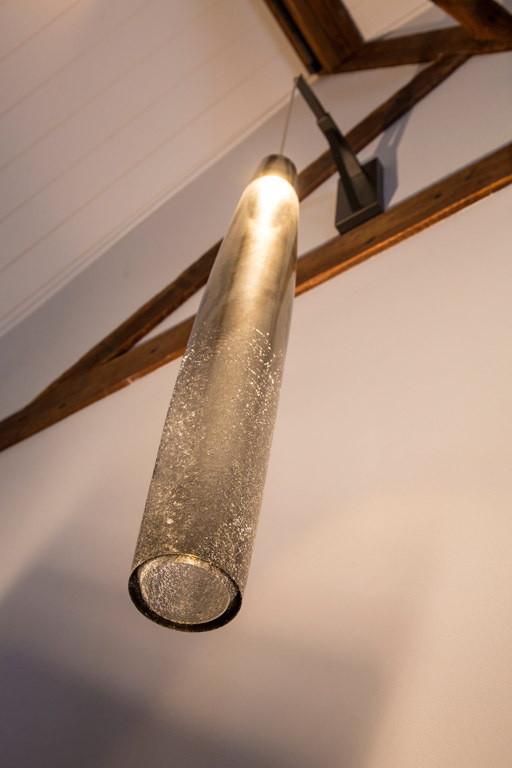 Karen solved the issue by utilizing twelve forty-eight-inch LED pendants dropped from barn style metal brackets all on dimmers. In the evening the room glows with an animated perimeter and firelight. Part of our challenge of furnishing this large open space was working around the barn posts. In this seating area we employed two iron plug in reading lamps to animate both sides of the sectional sofa. Kitty approved. 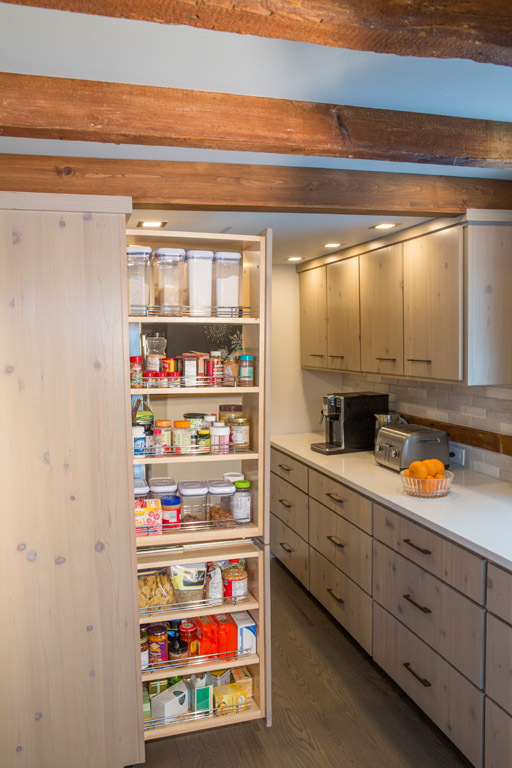 The kitchen was gutted to the studs to incorporate two needed spaces from adjacent closets and pantry that allowed us to expand the footprint. We replaced the windows and appliances and updated the wiring and plumbing.